Inventories remain critically low, and prices have riven above average. Sales slowed in December, but 2016 may set annual sales records. A regional shift in the recovery is underway as the West slows and the Midwest and Northeast catch up. December’s data from six of the nation’s leading monthly market reports paint a picture of extraordinary demand that has made inadequate supplies of homes for sale even more dangerous by driving up prices above sustainable levels in some markets. Inventories remain critically low. Beyond the numbers, which feature annual double-digit inventory declines in four of the six reports, many reports issued extraordinary alarms. Some reported new listings as well as current active listings. December’s sales were virtually unchanged from last year. However, the combination of an improving economy, low rates and the coming-of-age of the millennials contributed to a banner year for sales in 2016. Several sources, including Trulia and the National Association of Realtors, anticipate that 2016 sales totals will set multi-year records. A regional sea change is underway in housing recovery. The first markets to feel the combination of short supplies and strong demand saw prices and sales soar. Now, in the Midwest and Northeast, the same dynamics that lit up Western markets two years ago are kicking in. The real estate economy in 2016 broke records as well as hearts. As soaring values left homeowners with more equity than they’ve seen in a decade, there’s not much good news in store for thousands of frustrated buyers who couldn’t find a home to buy last year. While equity levels are finally recovering for long-suffering owners, buyers struggle with an affordability crisis driven by the double-whammy of strengthening demand and declining supply. Double-digit inventory shortfalls reported by most sources as the year ends a wake-up call for 2017. Now in its third full year, the housing recovery is washing over the nation like a tsunami, draining West Coast markets of middle-class neighborhoods that middle-class buyers can afford. Now it is lifting Midwestern and Northeastern markets, which have languished for years, turning them into the sellers’ markets of the year to come. The several monthly “national” market reports issued by brokerages, aggregators, researchers and franchisors use different data, analytical techniques and emphasize different facets of the same economic forces at work. When analyzed and compared, their similarities reinforce their findings and their different focuses enrich our understanding of the significant trends shaping markets. 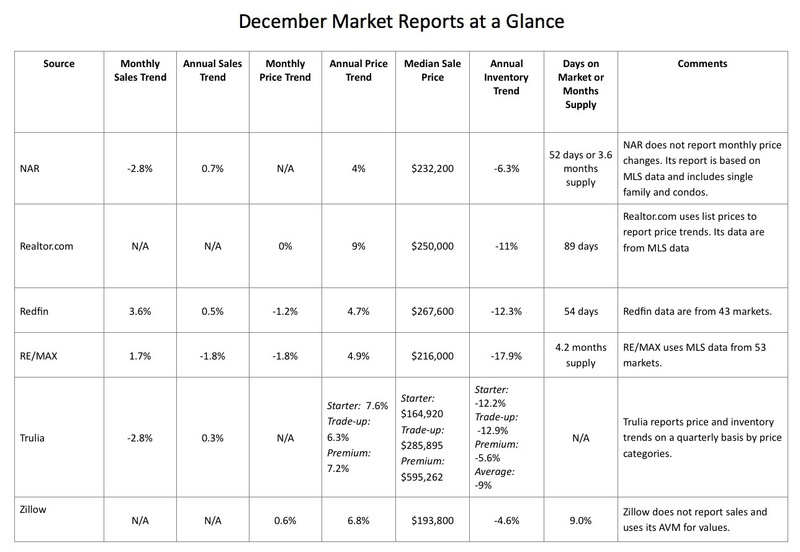 This review of December market reports from the National Association of Realtors’ Existing Home Sales series, realtor.com, Redfin, Re/Max, Trulia and Zillow was limited to national reports released within January. They are publicly available and, with a couple of exceptions, report prices, sales, supplies and time on market on both monthly and year-over-year bases. Beyond the numbers, which feature annual double-digit inventory declines in four of the six reports, many reports issued extraordinary alarms. Some reported new listings as well as current active listings. Redfin reported December new listings down 5.2 percent from 2015. Both Trulia and Zillow found inventory shortages among an extraordinary disparity of supplies by price tier. (Zillow: On a year-over-year basis, inventories of entry-level homes are 6.9 percent lower than last year compared to 2.4 percent for upper tier homes. Some of the reports with longer lifespans reminded readers that the December data are only the latest consistent monthly declines stretching back nearly two years. “Overall, inventory has fallen year-over-year nationwide for each of the past 23 months,” said Svenja Gudell at Zillow. “Total housing inventory at the end of December is the lowest level since NAR began tracking the supply of all housing types in 1999,” stated NAR in a release. “Prospective sellers were hesitant to list last month. Many of them are also buyers, and two transactions are much harder to pull off in a low-inventory environment than one,” said Redfin’s Nela Richardson. “Low inventory will moderate existing home sales as we enter 2017 and keep numbers below the pre-recession average as homebuyers contend with limited numbers of homes on the market,” stated Trulia’s Cheryl Young. Traditionally the slowest sales month of the year, December 2016 was no exception, though one or two sources reported slightly higher sales than November. December’s sales were virtually unchanged from last year, except for NAR. However, the combination an improving economy, low rates and the coming of age of the millennials contributed to a banner year for sales. Redfin reported that homes turned over at record speeds. “This tells us that buyers are not deterred by low inventory, election uncertainty and slightly higher mortgage rates,” said Redfin’s Nela Richardson. The combination of lower supplies and stronger demand pushed annualized December prices up from 4 percent to 9 percent, continuing the appreciation that has characterized the recovery. As noted below, the pattern of appreciation has changed over the year in different regions. A sea change is underway in housing recovery. The first markets to feel the combination of short supplies and strong demand saw prices and sales soar. Now, with prices pushing beyond affordable levels and inventories lower than ever, sales are cooling.